Political horse trading, cross-carpeting and somewhat politicking have continued to take the centre in Anambra State politics in recent times, this strange development has again boost the aspiration of the standard bearer/Governorship hopeful of the Labour Party (LP) Dr. Andy Uba, to return to the seat of government of Anambra State in 2010 even as the Next Level Campaign Organisation structure of Mr. Emeka Etiaba on Tuesday throws their weight behind him. Emeka Etiaba, son of the Deputy Governor of Anambra State was one of the gubernatorial aspirants of the Progressive Peoples Alliances (PPA) where he was tipped to win the party's candidacy before the surprise emergence of Hon. Uche Ekwunife came to the fore at the party's primaries. 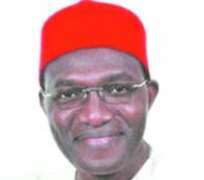 Again making known its resolve to join forces with Uba in the February 6, 2010 election (precisely 2 months), in a statement signed by the Director-General Next Level Campaign Organisation, Chief Jimmie Asoegwu, the organisation said it found Labour Party Gubernatorial hopeful, Uba humbled, able to listen and focused. The statements reads: “After a careful appraisal of the current political terrain in Anambra State and having resolved not to be a part of the Progressive Peoples Alliance's decision to foist a particular candidate on the state, we have taken our decision to partner with one of the candidates in the race since our aspirant is no longer running for the office of the governor in 2010. “This decision was collectively arrived at after deliberations with major candidates and their supporters. The criteria set out by us for our appraisals are; a study of the programmes of the candidates and their political party; possibility of merging the candidate's programme with our Next Level programme; seriousness and genuineness of the candidates. “Character of the candidate, under this heading, we decided to appraise the true character of each candidate and not the character ascribed to each candidate by blackmailers. Sincerity of purpose and acceptability by Ndi Anambra; Ability to work as a team leader and not as 'a know it all' sole administrator; ability to accept Next Level Organization as partners. “The Next Level Campaign Organisation after a careful study, not wanting to fall prey yet again decided to join forces with Dr. Andy Ubah of the Labour Party. We find him humble, able to listen and focused. “We decided that Next Level should ensure that the state does not continue to suffer the mal-administration currently being experienced in the state and we invite all our supporters and well wishers to join hands with Dr. Andy Uba as he is (in partnership with us) to take Anambra State to the next level,” he said. Meanwhile, the Andy Uba Campaign Organisation office at Udoka Estate has again become a bee-hive of activities as people from various political parties troop in to identify with the standard bearer. Almost in a similar manner to what Emeka Etiaba and his supporters did in September 13, 2009 according to huhuonline.com retrospective checks, it was a carnival of sorts that weekend when the Progressive People's Alliance (PPA) came alive in Anambra State when governorship aspirant in the 2010 election, Mr. Emeka Etiaba, and about 20,000 supporters defected to the party. Prior to that day he had within a week resigned his membership of the All Progressives Grand Alliance (APGA) because of what he called 'hostile environment and lack of internal democracy'. Declaring his support before the national and state leadership of the PPA at St. Andrew's Church Field, Nnewi, Emeka said the choice of the party as the vehicle to take the state to the next level was not by mistake. His words then: "The desire to take Anambra State to the next level made it imperative that we, formerly of All Progressives Grand Alliance (APGA) quit for our new abode to the PPA, where the basic tenets of democracy hinged on Right of Choice is given a pride of place. We find that internal democracy is alive and well here". It was gathered during that period that Etiaba said though quitting APGA was not pleasant, his organisation had no choice but to keep alive the Next Level vision by quitting the collapsing APGA house. This sheer anxiety of Emeka Etiaba over political dominance and relevance has however set a new tune entirely when the desperate politician found it difficult to pinch his tenth at PPA and now settling for Labour Party where he believes he could be favoured politically especially with Andy Uba who has enough looted fund from Obasanjo administration to wrestle power in the state come February 16, 2010.